Once considered the black sheep of the Defra family, the Rural Payments Agency (RPA) has advanced from disparate, struggling silos to a unified example of best practice in Government. Chief executive Mark Grimshaw outlines the approach behind this four-year transformation. When I took the helm of the RPA in January 2011, things weren’t looking good. Still mired in the aftermath of the botched introduction of the European Union’s (EU’s) new Single Payment Scheme (SPS) six years before, the Agency was failing in its payment duties with inaccurate data and major IT problems. This resulted in glaring payment errors and delays, stubborn processing backlogs, heavy EU fines and stinging criticism in the media and agricultural industry. In 2007/8 the Agency had an overall customer satisfaction score of 5.9/10. Three years later in 2010/11, custoer satisfaction with the Agency’s written communications was just 5.6/10, and media headlines including terms like ‘fiasco’, ‘scandal’ ‘disaster’ and ‘calamity’ were all too common in the wake of SPS 2005. As chief executive I realised very early on that the Agency’s key targets were flawed, leading to perverse operational behaviour where teams competed to do the easiest work. It was obvious that decision making needed to be brought back to a senior level to drive reprioritisation. Having dealt with comparable problems as managing director of the Child Support Agency (CSA), I knew large-scale change was required – the governance processes, structure and ways of working. 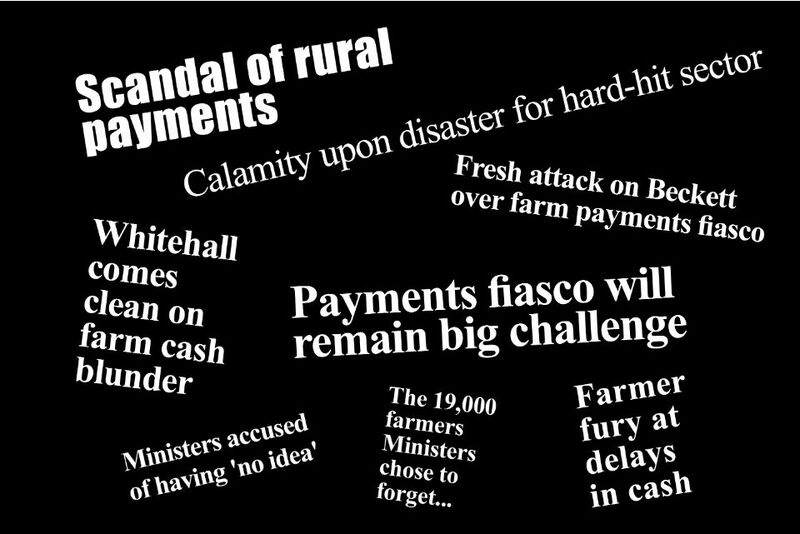 Newspaper headlines from 2006 highlighted the failings of the RPA. Up to that point the Agency had been subject to multiple reviews of its operations by third-party audits, resulting in £680m paid out in unforeseen operating costs and EU fines. I needed to establish centralised control, to know every detail of our budgets, operations and what was going on around our six main sites and scattered satellite offices. It was clear having the right people with the right skills was critical. I recruited an Executive Team (ET) of eight senior managers – each a specialist in their own profession – and non-executive directors to provide assurance and challenge. Sometimes going against the grain and thinking radically is required for large-scale change. Over the course of three long days in early 2011 we shared our insights and perspectives for the future vision for the Agency. We created a framework and roadmap for change, along with a visual representation of our strategic plan that is still on the wall in our boardroom. Under an organisational restructure which I had previously introduced successfully at the CSA, we created a five year plan in which all the components – departments, processes, roles, end goals – are tightly linked to each other, building on strengths and interdependencies across six key areas. It took nearly four months to lay the foundations for the necessary roles, processes and structures which would need to be followed in the years ahead. However, in doing so we developed a strong understanding of our strengths and weaknesses, and were able to detail the first three years – a Strategic Improvement Plan, consisting of 45 separate projects, 21 of which were public commitments. I made sure there were only two ways to initiate change within the organisation: for new policy requirements to go through an external relations gate and services to go through an internal change programme delivery gate. It was only by effective and rigorous control of what new projects to start, that we were able to keep the improvement programme on track. This approach allowed us, as an ET, to properly plan, monitor performance and analyse new programmes to ensure their success. At this point our SPS figures spoke for themselves. By the end of 2010 scheme year we had only paid 85% of our customers 74% of what they were owed. We launched the plan in early 2012, overhauling many areas of the Agency and drilling down to cleanse, streamline and improve multiple lines of business – from updating our IT systems and overhauling our complaints and appeals service to correcting inaccurate data and properly equipping our field inspectors with the latest kit. We needed to operate at maximum efficiency and effectiveness to turn our customer service, operational performance and reputation around - not to mention get ourselves ready for the next round of CAP Reform changes. One of the main challenges thrown up by the framework was the poor state of our relationships with customers. Where in the past the Agency had focused on the less complex, smaller value claims in order to meet its December targets, our new approach involved allocating the more complex claims to senior caseworkers, resulting in these higher-value claims being paid earlier. As a result, the percentage of customers paid in December increased significantly. By the end of December 2011, 88% of customers had been paid, compared to 85% in the previous year, and in 2012 the end of December figure had reached 93%. This improvement in performance carried through to March 2013 with 99% of claims having been paid by the end of that month, compared to 95% in 2010. This focus on more complex claims delivered even greater improvements in the percentage of the fund paid. From our dismal figures of 74% in December 2010, we saw it rise to 82% in 2011, 88% in 2012 and on to 95% in December last year. This change in the first three years meant £309m more was paid to the farming sector in one month than would have been the case without the shift in focus. This shift to putting the customer at the heart of everything we do is now quite rightly seen as fundamental, and our customer satisfaction figures reflect this. Perceptions of the Agency have improved year on year - on a scale of 1 to 10, customer satisfaction was measured at 8.7 in 2013, up from 7.1 in 2011 and 7.5 in 2012. In the UK, a customer satisfaction rating of 8.7 puts the RPA on a level with many of the best performing companies in the private sector. At the same time we were very clear about the expectations of our people internally, so they would work with us. A culture shift comes about because of leadership actions and the changes you make – we were able to increase our performance by record levels at the same time as a near 25% reduction in our workforce. In the early phase of our change programme our focus was on sorting the task and getting our business processes in place - then we tried to focus on change at a team level. It’s only been in the last 12 months that we’ve started to focus down on individuals and driving the change at that very personal level, so I guess the culture shift was about clear expectations, support, reward, recognition of the positives and challenge for the negatives. We were really keen within the RPA to grow our own capability and have less reliance on external resources. Traditionally, talent management schemes are focused on developing your leadership and management capability at quite a senior level. Given our grade profile within the Agency, we decided to approach it from the bottom-up rather than the top-down. The scheme has gone excellently with a very high interest, and we’ve operated an assessment centre to select people onto it. The members are really enthusiastic and very positive about their experience on the scheme, and we are starting to reap the dividends across the business because we have identified those people who have a lot to contribute. We are now enhancing their capability as we place them into key roles, and it’s having a positive impact in terms of their engagement. The Agency’s successes and achievements were highlighted this year in us having the sole remaining qualifications on our accounts lifted by the National Audit Office, and completing the first three years’ activities of our Five Year Plan in just two – one year ahead of schedule. Our operational performance was record-breaking, with 99% of our SPS customers being paid 99% of the fund value by the end of March. In just two years an improvement from 94% and 88% respectively. In the final year of the SPS we have just delivered our best-ever payment performance for our customers. Farmer satisfaction has dramatically increased over the last 5 years. Whilst it could be argued my ‘command and control’ management style is not the most modern way of doing things, it is crucial in certain circumstances to get on top of a situation quickly and avoid further waste of public money. The RPA needed this when I joined in 2011, and we’ve seen a very respectable turnaround in the four years since. Being accountable means you can’t be reluctant about performance evaluation and statistics. To benchmark success you must track your progress, and data and systems for statistical and analytical information are imperative. Collective consciousness is also a positive organisational trait. In the RPA, all department heads know what everyone else is doing. While they may not be directly responsible for someone else’s outcomes, they support one another, providing input into initiatives to help make sure of the success of the wider agency. Having headline knowledge of all the Agency’s operations enables senior leaders to work smarter, not harder, and continually meet our targets and goals. With big changes happening this year in the way our customers apply for subsidy payments, our job is to ensure that everyone eligible who chooses to claim is able to do so. This is why we’ve been working closely with our customers, stakeholders and the industry in developing the new online service. We shouldn’t underestimate the challenges that we face in working together to achieve this, but I’m confident that we have put ourselves in the best place possible thanks to our hard work over the last few years and we are as ready now as we can be for the road ahead. What works? The rise of ‘experimental’ government. More civil service spin - hasn't got a clue in the real world; look at the unmitigated disaster of he 2015 BPS. out-turn and the consequences for the 2016 claim process. Claimants for 2015 still unpaid at 05/05/2016 (despite RPA assurances and spin) with no communication or advice from the useless Agency. Grimshaw's salary and retirement pension assured........Indefensible.